﻿Selected Topics in the History of Biochemistry Personal Recollections. I. The Coris in the U.S.A. 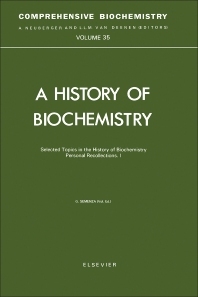 Selected Topics in the History of Biochemistry: Personal Recollections, I presents selected topics in the history of biochemistry based on the authors' personal recollections. These topics range from the isolation of Cori ester and the discovery of sugar nucleotides to the work of Frederick Gowland Hopkins (1861-1947). Ion-coupled membrane processes are also discussed, along with fructose and fructose-2,6-bisphosphateas well as lysosomes and glycogen. Comprised of 12 chapters, this volume begins with the discovery of Cori ester and the concept of phosphorolysis before turning to the discovery of sugar nucleotides and research on ion-coupled membrane processes. The reader is then introduced to studies of fructose, fructose-2,6-bisphosphate, lysosomes, and glycogen; the contributions of Frederick Gowland Hopkins in biochemistry; and a short autobiography of Juda Hirsch Quastel, with emphasis on his research work on the concept of active centers as a possible explanation of enzyme action and his investigation of the effects of malonic acid and substituted malonic acids on bacterial dehydrogenases. The remaining chapters focus on a biochemist's approach to autopharmacology; the early development of modern protein chemistry in Uppsala, Sweden; and the biographies of two Russian scientists, A. N. Bach and Sergei E. Severin. This monograph will be of interest to students, practitioners, and researchers in the field of biochemistry.